More under the radar than other card releases that year, 1933 Tattoo Orbit Baseball is another early entry in the gum card market. 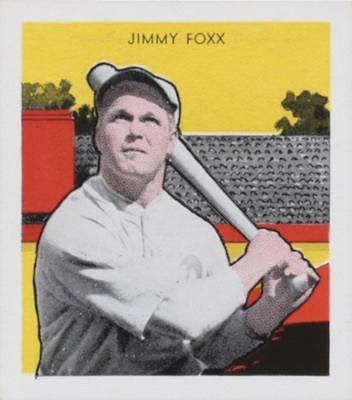 Although it does not include Babe Ruth, several top Hall of Fame names, like Rogers Hornsby, Jimmie Foxx and Dizzy Dean, combine within a 60-card set to offer an appealing, but more obscure, set chase. 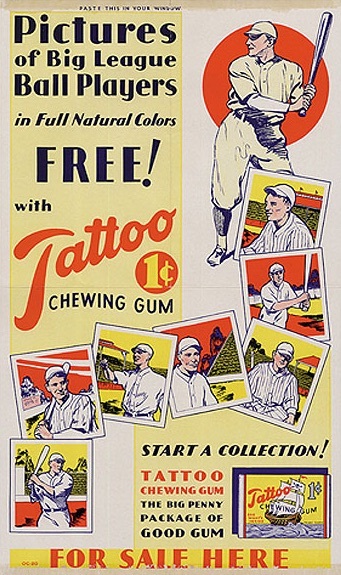 1933 Tattoo Orbit Baseball cards were originally issued in packages of one-cent Tattoo Chewing Gum, a product from Orbit Gum Co. The Chicago-based gum company elected not to include any advertising or branding on the actual cards, leading to some confusion over the years from less-knowledgeable collectors. The cards are officially designated R305. 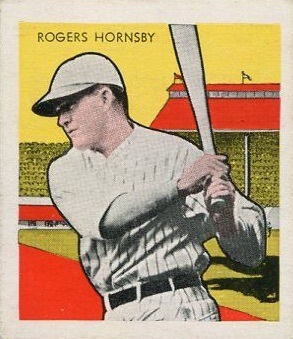 Nearly forming a square, the 2" by 2-1/4" cards are noticeably smaller than other gum cards from that era. 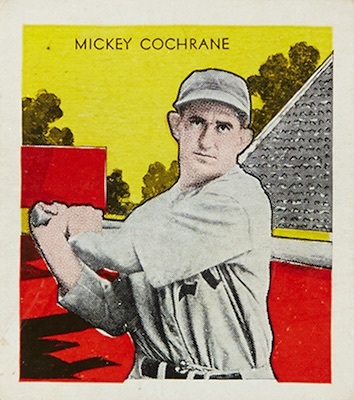 Similar to other designs, the 1933 Tattoo Orbit Baseball cards feature a black-and-white player photo along with a colorful background. However, the largely red, yellow and green color scheme makes the card fairly easy to distinguish and the players stand out a little more due to the added flesh tones applied to the face and hands. Lastly, the player's name is noted at the top and a thick, white border encloses the design. 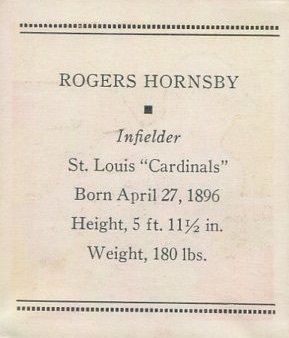 The card backs are quite simple, with nothing more than a plain design that bookends the player's name, position, team, birthday, height and weight. As noted above, there is nothing printed on the cards to directly tie 1933 Tattoo Orbit Baseball to any specific brand or year. As seen below with the card back image where you can clearly see the front design, the stock is very thin, making the cards particularly vulnerable to wear or damage. Given that Orbit Gum Company was based in Chicago, it is not too surprising that the Chicago Cubs fill a large percentage of the 1933 Tattoo Orbit Baseball checklist. 15 of the 60 cards cover the Cubs, while no other team has more than six subjects. 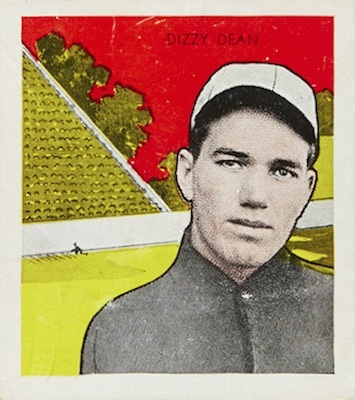 Although several teams only have one or two representatives, it is more surprising that four teams were left completely off the checklist, including the New York Yankees, Washington Senators, New York Giants and Detroit Tigers. 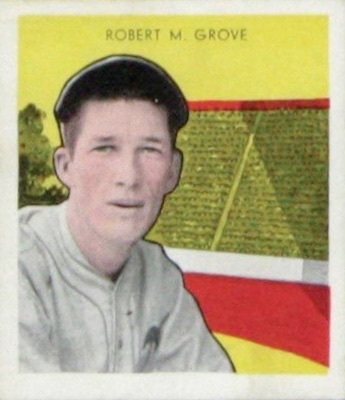 While it does suffer slightly from the bigger omissions in the checklist, 1933 Tattoo Orbit Baseball is buoyed by 17 Hall of Fame options, including Rogers Hornsby, Jimmie Foxx, Dizzy Dean, Mickey Cochrane and Lefty Grove. Hornsby is particularly notable because the card is one of several reported short prints, but the only Hall of Fame inductee. However, not all collectors feel the short prints are any more difficult to find. 1933 R305 Tattoo Orbit Bill Cissell Indians SGC 10 !! 1933 R305 Tattoo Orbit Richard Bartell Phillies SGC 35 !! 60 cards. Shop for base cards on eBay. Cards are listed in alphabetical order by last name. Short prints (SP) are noted below.